While lying on my back in a beginners Yin yoga class recently, the instructor asked us to “surrender to our mats.” She wasn’t asking us to give up (to raise a white flag), she was encouraging us to let go. Normally I would visualize releasing a balloon into the bright blue sky whenever someone had asked me to “just let go.” But in my yoga class that day, instead of envisioning a floating balloon, I felt myself (for the first time ever) letting go and falling into a net. “Is this what it feels like to surrender?” I remember asking myself, followed by “I wonder what surrender actually looks like? I grew up with Lori and Val in our hometown of Swift Current, Saskatchewan. I don’t see them as often as I should these days but I couldn’t count the number of times we have been in each other’s company at house warming parties, birthday parties, class reunions and celebratory Friday beers. 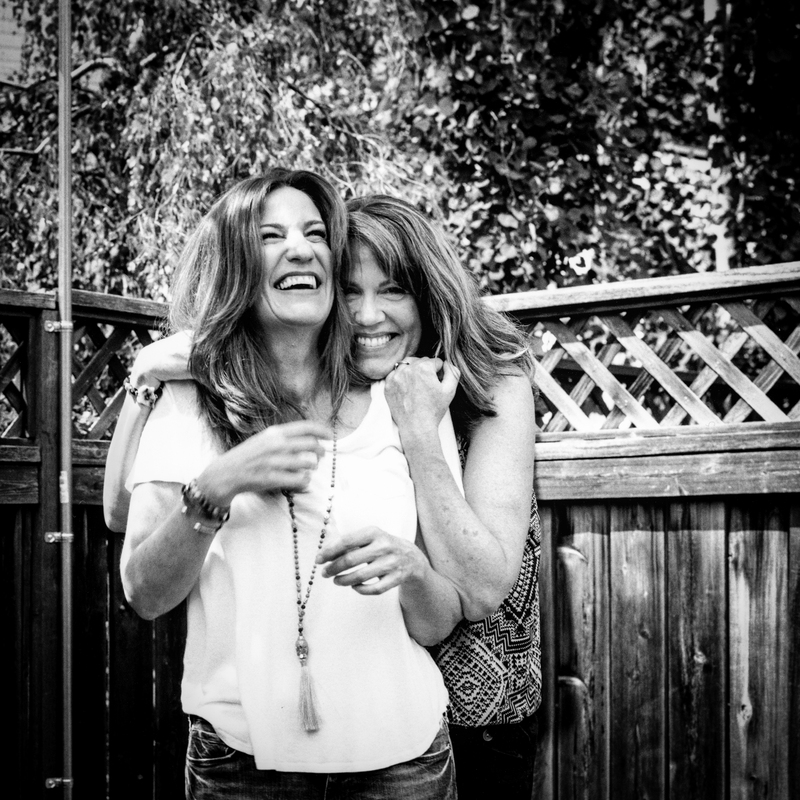 These days Lori and Val publish a weekly humour blog called Sangria Sisters where they write about an impossibly diverse range of topics from ‘80s fashion trends to The Top 10 Reasons Women Love Wine! The Sisters have also been busy volunteering for the non-profit aid society Mealshare whose mission is to end youth malnutrition and hunger. Right now, at this exact moment two of their posts stand out for me: their beautiful, poetic description of depression and a touching Father’s Day card to their father Don and to Lori’s husband Scott who is bravely fighting a recent cancer diagnosis. When I took Lori and Val’s portrait this past July two things stood out for me. First, I had suddenly realized I had never been alone with the Sisters before and second, how humbled I felt by their spontaneous, unconditional love and acceptance of one another. Taking their portrait was effortless as they moved into each pose with tenderness, humour and grace. So this is what surrender looks like! Emotional and physical honesty in the presence of unconditional love. To feel safe enough to cry when we are sad, and laugh when we need it the most.